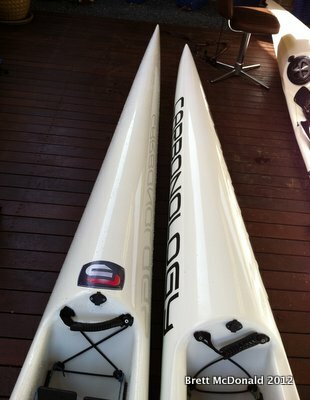 While the “Flash” decals are just that, the ski is much like the other Carbonology ski’s, somewhat understated or to once again borrow from Rob’s Atom review “simple and elegant”. This meshes quite well with what I know of the Carbonology team of manufacturer and distributors; they are content to let the skis talk for themselves and have been a slowly but surely increasing their presence in the ski market without much fanfare. Here we are 6 months later and after being initially released on the European market it has finally landed on Western Australian shores and should be in the hands of those in the Eastern states as this review hits the web. The Vault I’ve been paddling is in the Hybrid lay-up so when I was asked which lay-up I would like to demo the flash in I went for the same lay-up. 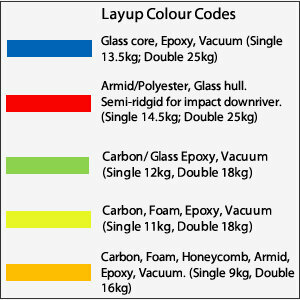 I have found the hybrid lay-up of Glass re-enforced with Carbon to be quite stiff and very robust. My ski is still in excellent condition despite the accidental knocks that all skis cop over time; I really think it is the best value for money from all the lay-ups available. As opposed to other manufacturers who quote a weight for specific ski’s Carbonology have gone the ballpark method. There is obviously much less material used in say an Atom to a Flash, yet they quote a flat 12kg for all hybrid lay-up single ski’s. On the bathroom scales test my Vault weighs in at 12.5kg while the Flash weighs in at 13kg. 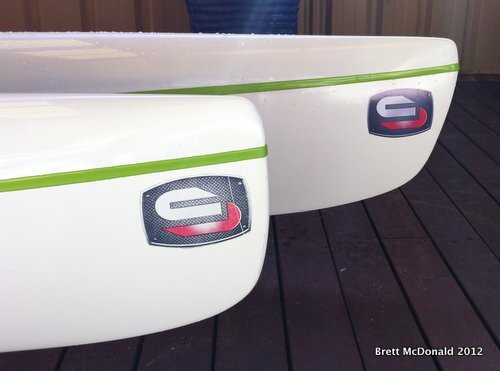 So to those familiar with the Vault how does it compare… well I lined the two ski’s up bucket to bucket and this is what I found: there’s an extra 30cm in the nose and 13cm in the tail. After 35 kms in the Flash over 3 days this week I have yet to have any issues, the bucket is quite snug on my 90kg 6ft 2in frame, which I feel adds to my stability. While initially I though the bucket a narrower version of the Vault bucket I also noticed that the hump under the knees is lower. This is sure to please the short-legged paddler who has problems with big humps under the knees. When setting up the footplate for my leg length I also noticed that the bucket is slightly longer, not sure exactly how much but there is at least two more notches left on the footplate adjustment in the Flash. Given that I am 6ft 2in you would need damn long legs to max this bucket out. Looking forward from the bucket this ski is decidedly thin. Take a close look at the photos and get yourself a tape measure out, a 315mm catch!!! 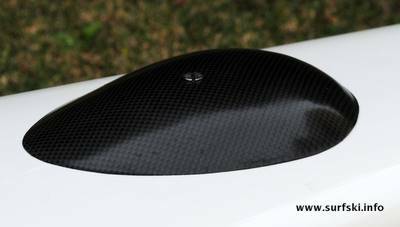 The footplate is the standard Carbonology plate, which appears to be a favoured design among many ski manufacturers. 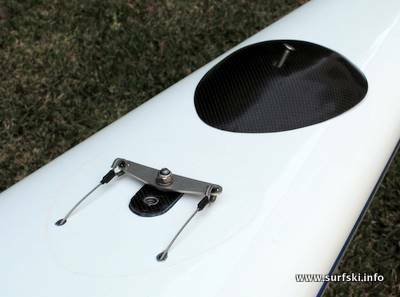 The footlength can be adjusted in a matter of seconds by pulling out the locator lugs, adjusting the length then feeding the rudder lines through the pedals to bring them back upright. The only time some knot tying is required is when you wish to adjust the pedal angle. Carbonology skis use stainless steel rudder cables attached to cord in the footwell, which in my mind is the best of both words, giving very precise rudder control and feel while allowing easy adjustment footplate length and rudder pedal angle. After my swim I decided to check out the rudder and found that it was a swept back elliptical rudder. Hein from Carbonology stated that in testing the usual rudder shape was too aggressive and this new rudder smoothed that out but still gave good feel and response. One pleasant surprise was that they have kept the same rudder shaft length, so I was able to swap out the ocean rudder for my river rudder, however the new elliptical rudder has the shaft set further back from the leading edge so if fitting a weed deflector it needs to be done with the ocean rudder fitted so as not to foul it when switching rudders. Hein from Carbonology tells me they have been able to integrate a one-way valve into their bullet scuppers that stops the footwell from filling with water when you slow to a stop. This would be very handy sitting on the start line to a race. Unfortunately they are only fitted as an option on new skis and he didn’t see fit to send a ski with them fitted to us for review so I was unable to test its performance. I look forward to hearing what becomes of this new design. 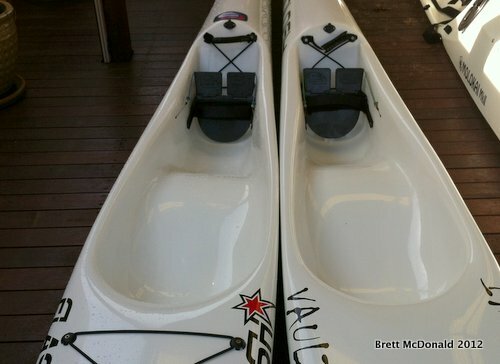 The biggest reason I bought a Vault was for the added stability it gave over the previous Epic V10L I had been paddling for the 9 months prior. The Vault has me a smidgeon more stability, which enabled me to really focus on my stroke, rather than losing energy to staying upright. When I decided I wanted something quicker again I started paddling most of the big name elite skis, which reminded me of the speed versus stability question again… just how much extra speed can I get out of a “faster” ski in choppy conditions or when I am fatigued. I joined the regular Saturday morning group in Mandurah for a 15km paddle through the estuary and canals. The tide was ripping in that day so any thoughts of figuring out what speed the ski was doing were thrown out the window. I decided the paddle would be more about how the ski felt. I put the speed versus stability question to the test with a 5.3km triangular ocean course in 10-15 knot winds and a short wind driven chop of 1-2 foot . I recorded each time trial on my Garmin, but placed the Garmin where I couldn’t see it, as I didn’t want to have the speed displayed encourage my performance. I went flat out for both efforts with a 40-minute rest period in between. The first leg of the course was cross chop for about 600m then turned into a approx. 2.5km upwind leg with the chop at about a 20 degree angle from the right before turning for a straight downwind leg of about 2.2km. I took the Vault out first and as I bought this ski for its cross chop and upwind abilities found the going pretty straight forward. I was copping some waves in the lap over the bow and the odd one in the chest but the double bullet scuppers made quick work of the water in the footwell. Then it was around the marker and into the short steep downwind chop, which is always fun in this short ski. After my rest I set off on the Flash for a warm up then headed off cross wind. The ski was just a little tippier but not to the extent that I needed to brace, maybe a few wider strokes on occasion were needed to make sure I wasn’t leaning too far but I didn’t feel unsure in the ski. I did catch myself feeling like I needed to hurry up, maybe that I wasn’t achieving the same stroke rate that I had on the Vault? Turning upwind the effect was almost immediate, the longer length of the ski ironed out the chop and the lesser degree of pitching kept the ride much drier. Although the wind was 20 degrees from the right the low volume nose wasn’t affected. Again I felt as though I was putting in some wider strokes and couldn’t rate as highly. As I rounded the marker for the downwind I was right on a runner and as my GPS would later tell me I accelerated straight up to 15km/hr….then as I kicked the rudder pedal to move off the runner as it dissipated I found myself in the water!!! What the heck? !..how did that happen?! That question didn’t last too long in my mind as the realisation that I was 2 km offshore in waters where a Great White attacked a ski only the week before rushed into my mind. I have a small river rudder on the Vault, which really needs to be worked hard to steer in these conditions, I hadn’t given the Flash’s ocean rudder the respect it deserved and paid the price. Now I was aware of how well it steered I had no further problems and quickly found myself paddling through waves to catch the next lump. When I finished the course on the Flash I honestly had no idea which ski had gone faster, so after a few photos of the ski on the beach it was home to download the tracks and analyse the data. I wasn’t surprised at what I observed, the Flash and the Vault were neck and neck on the cross chop and upwind and if you were to twist my arm for a winner I would probably have to say that I think the Vault was the better performer. In the downwind the Vault appeared to have better acceleration onto the short steep chop but the Flash held the chop better and didn’t seems to wallow off the back of runs as much. I was able to be just as aggressive in steering the Flash and could paddle as hard as I wanted through a wave to get onto a run without feeling the wobble I have experienced in some elite skis. Taking into account the 30 seconds it took me to remount and get going from my swim the Vault was only 30 seconds quicker over the 5.3km course, not a definitive result by any stretch of the imagination. 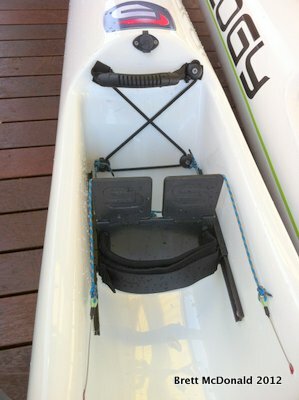 I paddled the ski in a 28km marathon flat-water paddle. Before I reveal the race results we finally got some still weather: the ocean was like a pond with slack mooring lines in the boats moored off my beach and each one facing a different direction. I knew the conditions were perfect for some comparison runs with the Vault. After warming up in both skis and paddling a 1km straight line over the same water at about 80% effort (marathon race pace) I established that the Flash showed a .3km/hr speed advantage over the Vault. Another difference today was that I was doing a lot more turns washleading than the previous race, so I must have been paddling at a reduced intensity! One other thing to note was that as I fatigued I didnt feel any less stable in the ski, somewhat important in an elite level ski. I hope this review has shed some light on this new entry to the market. 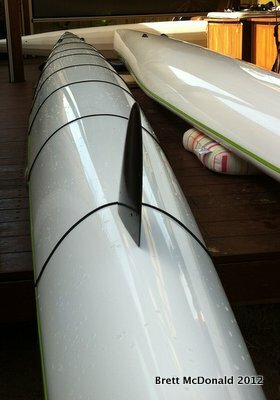 Those looking for a low volume ski that isn’t prone to being blown around by cross winds. 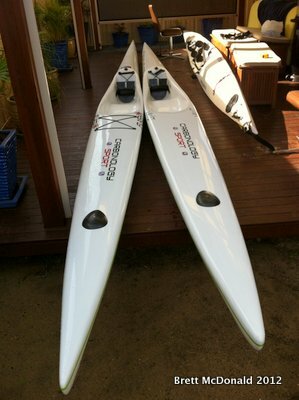 Those looking to move up from an intermediate ski such as the Vault, Swordfish or Evo II.